Note: your entry fee is used to assist with costs of timing and providing medical assistance during the event. All entrants who complete their event will receive a participant pack containing merchandise and t'shirt. Competitors must check-in on the day at least 30 minutes before their scheduled start time. Only competitors who have paid entry fees in full will be allowed to compete in the event. Get an outback running experience like no other. 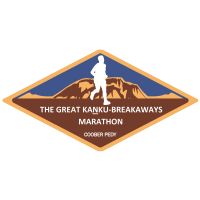 Enter the Great Kanku-Breakaways Marathon and fun run in the spectacular Kanku-Breakaways Conservation Park in South Australia. Entries will also be taken on the day (cash payment only). Children older than 10 years can enter the 2.4km fun run but will ineligible for prizes. This year you can also run as part of a team. Starting at the main lookout in the park—Kanku Pulka (meaning Big Shelter)— you will run down from the escarpment, through the spectacular coloured hills of the breakaways country, onto the moon plain and alongside the dingo fence. You will return to the lookout along the same route. Each perspective is different and seeing them both in one visit to the park is a fantastic experience. If your family and friends aren't running with you, they can watch your progress from the lookout, grab a bite to eat and drink, wander around our stalls, learn about local artists and participate in an art class at the start and finish hub. Event presentations including a random prize draw will be held with the beautiful Kanku - Breakaways as the backdrop. All the tracks used for the event are closed to vehicles and there are aid stations every 2.5km. Free buses leaving Coober Pedy will shuttle competitors and visitors to and from the park. As part of National Reconciliation Week, the event will bring entrants, local community and visitors together over a free barbeque. The Kanku-Breakaways Conservation Park is an Aboriginal owned park, managed by a majority traditional owner co-management board. Come and explore Coober Pedy and the outback. Enjoy a fantastic community event in a very spiritual place, the Kanku-Breakaways Conservation Park. Online entries close Tue 28 May at 11:45pm.